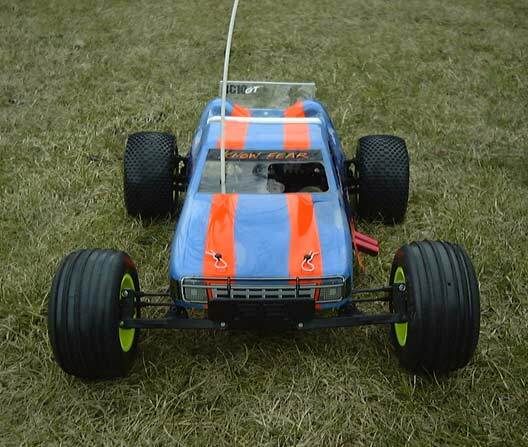 I have been into radio controlled stadium trucks since 1995. 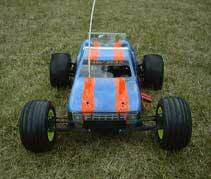 The electric RC10T is the first one I bought. I raced it for one summer and took 2nd in the beginner class. I stepped up to a RC10GT Team Gas Truck in February of 1999. I bolted in a OS 15CV-X engine, installed a 4 shoe clutch, attached a CVEC Power Sustem exhaust pipe, added an inline fuel filter, bored out the maninfold to match the opening in the engine, replaced the stock antenna holder, protected my receiver with a Kyosha receiver cover, secured a rear wing in the back, upgraded from a 15 to a 16 tooth cluth bell, and switched the original disk brake system with a stainless steel brake hub and disk brake. I purchased an A-Main chassis January 3rd, 2000(no pics yet). Shown in the photos are the original tires but I wore out the rear ones in 2 weeks (It was fun to do donuts in the drive way though). For the snow I now have a set of "Sand Paws" sand tires. This is my second custom paint job.